Univ of Chicago Pr. Hardcover. 0226569934 New Condition. . New. Univ of Chicago Pr. Hardcover. 0226569934 Like New Condition. . Fine. Univ of Chicago Pr (Tx). Used - Good. Ships from Reno, NV. Former Library book. Shows some signs of wear, and may have some markings on the inside. 100% Money Back Guarantee. Shipped to over one million happy customers. Your purchase benefits world literacy! Univ of Chicago Pr. Used - Very Good. Light to moderate shelf wear. Complete. Clean pages. Oxford: Basil Blackwell, 1972. 1st Edition. Hardcover. 269p. A hardcover book in near-fine condition with a dustjacket in very good condition. Edges of cover lightly tanned. Otherwise clean and tight. The dustjacket is price-clipped and the spine is mildly sunned. The jacket text is starting to bleed into the surrounding white area, but is still fully legible. Otherwise, the jacket is in excellent condition. Needham analyzes the nature of belief and explores Wittgenstein's question of whether belief constitutes experience. Oxford: Basil Blackwell, 1972. 1st . Hardcover. Very Good/Very Good. 8vo - over 7¾" - 9¾" tall. Slight roll to top of spine. Minor wear to jacket edges and sunning to spine. Light pencil markings throughout. Overall clean, bright and tight. 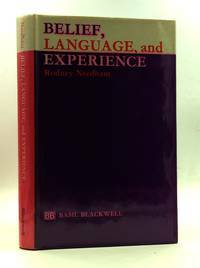 Oxford: Basil Blackwell, 1972. vii-xvii, 269pp; purple boards with scotch-tape marks to board edges, gilt title to spine, library stamp to bottom edge.. Hard Cover. Fair. 8vo - over 7¾" - 9¾" tall. Ex Library. Oxford: Basil Blackwell, 1972. 269 pages in very good condition. Purple hardcovers with gilt spine titles. Corners not bumped. Purple DJ with multi-colour titles. Spine faded, light wear on corners and edges. NEAR FINE/VG. First UK Edition. Hardcover. Near Fine/VG. Oxford: Basil Blackwell, 1972. First edition. Hardcover. Near Fine/Very Good. First edition, 1972, hardcover with purple cloth boards in dust jacket, octavo, 269pp., not illustrated. Book near fine with mild toning to edges of boards, binding tight, previous owner's name to front flyleaf, otherwise text clean and unmarked. DJ VG with rubbing, mild soil, sun to spine, front flap creased at corners. Univ of Chicago Pr (Tx), 1973-02. Hardcover. Good. Blackwell Publishers, 1973-01-01. Hardcover. Good. Blackwell Publishers. Used - Very Good. Former Library book. Great condition for a used book! Minimal wear. University of Chicago Press, 1973. Hardcover. Good. Disclaimer:A copy that has been read, but remains in clean condition. All pages are intact, and the cover is intact. The spine may show signs of wear. Pages can include limited notes and highlighting, and the copy can include previous owner inscriptions. An ex-library book and may have standard library stamps and/or stickers. The dust jacket is missing. At ThriftBooks, our motto is: Read More, Spend Less.